A life tied to the station 6.5 days a week and on twenty four hour call. You could almost guarantee they would be called out at Christmas and New Year, because the pits were empty, no maintenance was being carried out and gasses built up. A job where you had to risk your life and health, what were the financial returns? Les Calladine started work at Ilkeston Mines Rescue Station on Monday 24th October 1938 on 3 months probation. He had free rent, coal and lighting together with £2.16/- a week. On passing his probation period he received an extra 15/- a week. But before he started he had to give his boss 10/- for shoes. 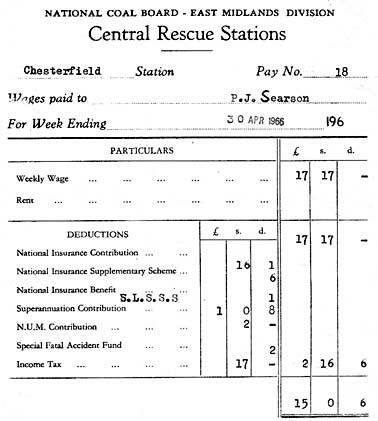 In 1966 Pete Searson got 15 pounds and six pence for his weeks work, plus a roof over his head. The only way to make ends meet was to be as self sufficient as possible and do a little moon lighting. Most of them had large gardens but they were mainly set aside for vegetables. During the war these gardens were extended when they were given permission to grow vegetables on the railway embankment. Some of them, including Philip had large green houses where they grew tomatoes. Another rescue man kept a pig and frequently visited his neighbours asking for potato peelings and scraps, while others kept chickens and grew mushrooms. TV was still fairly new on the scene shortly after Philip joined. He managed to arrange to have Thursday evenings off so that he could attend a TV repair course at Peoples College, Nottingham. This certainly paid dividends, the draw back however was that they soon had more TVs in the house, than they knew what to do with and Lottie, his wife, usually had to collect and deliver the TVs as Philip was not allowed off the station. Pete drove a taxi and helped out at funerals, he could get five shillings for an afternoons work.